As we reach mid-2013, the must have kitchen trend of the year continues to be cabinet refacing. Back in January, top design experts announced that the hottest trend of the year was going to be kitchen cabinet refacing. Let’s Face It Cabinet Refacing has since noticed that many customers throughout Montgomery and Bucks counties are choosing this alternative design route when renovating their kitchens. Wonder why? It’s easy to figure out. Choosing to install brand new kitchen cabinets can take up nearly 50 percent of your total kitchen renovation budget. You can save tons of money by refacing your current cabinets and using the rest of your budget towards other room renovations. The process of refacing kitchen cabinets includes: refinishing existing cabinets and drawer fronts, installing new wood or laminate over the cabinets and installing new cabinet doors and drawer fronts. New hardwood is also installed and the interiors of the cabinets can be painted or stained to complete the upgraded look. Kitchen cabinet refacing gives your kitchen a whole new look, at a much lower cost and is also a much less involved renovation process. You will be able to use your kitchen during the construction process and your new kitchen will be finished and usable in a short amount of time. Most kitchen cabinet refacing jobs only take a few days, depending on the size of the kitchen and any extra renovations that need to be made. 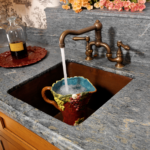 If you are looking to remodel your kitchen in the next few months, keep in mind that some current popular trends include mixing cabinet colors and emphasizing on stylish sinks. 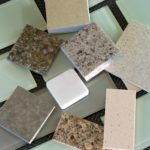 Design experts say instead of choosing just one color for your kitchen cabinets, a combination of different colors will be trending throughout the rest of 2013. Stainless steel, deep-bowl sinks are also a top pick for homeowners looking to update the look of their kitchen. At Let’s Face It, Inc., we specialize in high-quality kitchen refacing transformations with a team full of qualified and experienced workers. Our staff designer will work with you to personalize your kitchen renovation project to make sure it’s exactly what you want. Contact us today for a free consultation on your cabinet refacing project!